After the war (1939 to 45) Motor Cycle Sport was slow to resume activities due to Petrol rationing and it was several years before clubs could run events. The Salop Motor Club at Shrewsbury which was formed in 1931 and had run Grass Tracks and Trials approached Brigadier Sir Alexander Stanier, Bart, DSO., MC about the possibility of using his ground near Hind Heath. The venue had been used before the war by the Crewe and Nantwich Light Car Club for Hill Climbs. Permission was granted and on March 5th, 1950 the first scramble was held restricted to Midland riders. The Results show E. Purslow winning the 125 c.c. race from a J.V.Smith, both riding BSA’s. Don Evans on a 500 Ariel won the main events and 1000 spectators attended. A second scramble was held on July 23 attracting a similar sized crowd. During the second half of the twentieth century, the history of Hawkstone Park was almost inextricably entwined with the British 500cc Motocross Grand Prix. 21 such contests raged round the rough, tough sandstone circuit, the first during the inaugural year of a European Championship in 1952. 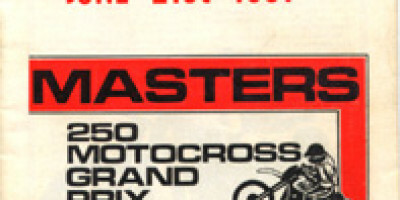 Hawkstone Park also hosted half a dozen dramatic 250 GPs in the 1970s and ’80s, two 125 GPs in 1976 and 1989 and, more recently, has concentrated on an outstanding early-season international established in 1999. But the venue actually started life as a pre-war hill-climb back in 1938, run by the quaintly-named Crewe and Nantwich Light Car Club! The winner was the driver who made it furthest up the awesome hill which remains the single most breathtaking feature of the track to this day.